Eid ul Adha Mubarak to everyone across the globe and also Hajj Mabrur to all those who got the opportunity to go on this blessed journey this year. May Allah Subhan Wa Ta’ala accept their Hajj and give this opportunity to each one of us. Even though Eid ul Adha is primarily about meat, no festive occasion can be complete without some indulgent desserts. In my house Sheer Khurma or sevai is a staple on both Eids . 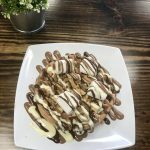 However, we often make other desserts too for Eid parties in the subsequent days. Traditionally, kheer is slow cooked over a low flame for several hours to get a rich and creamy consistency. However, since I rarely have the time or patience to do it the traditional way I usually sneak in a can of condensed milk to get the same rich taste in less than half the time. I prefer to use coarsely ground rice in my kheer. Some people prefer to call it phirni but usually phirni contains very fine ground rice. If you prefer to keep the rice whole you may choose to do so. 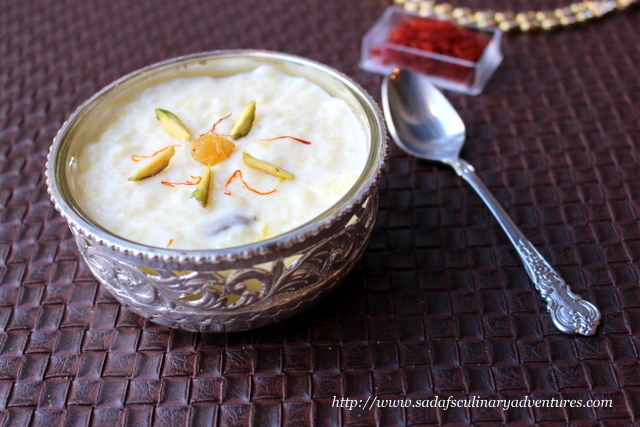 For special occasions like Eid I like to add flavor to my kheer with a dash of saffron, kewra and cardamom. Since all these three flavoring agents have a very strong flavor, I prefer to use them in very small quantities . The combination of all three gives the kheer a wonderful aroma and taste. 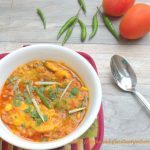 If you are making it for everyday consumption you can skip the kewra water and saffron. For those of you unfamiliar with kewra water, it is a sweet smelling colorless liquid available in clear glass bottles at desi (South Asian) grocery stores. I believe it also comes in concentrated form like other essences/ extracts and is sold in small bottles. However, I prefer the diluted version which is sold in larger bottles. If you choose to use the concentrated version you will need to reduce the quantity mentioned in the recipe. Wash and soak jasmine rice in water for 1-2 hours. Drain and spread on a paper towel lined plate . Allow the rice to dry for a couple of hours. You may keep it under a fan to speed up the drying process. In a clean, dry blender jar pulsate the rice for just a few seconds to grind it coarsely. Do not make it into a powder. In a small bowl soak the saffron strands in kewra water. Cover and keep aside. Boil milk along with cardamom. Add the rice and cook on low flame until rice is almost tender, about 15-20 minutes. Keep stirring the mixture so that it doesn’t burn. While stirring constantly add condensed milk. Cook for 5-7 minutes until you get the desired consistency. Remember that the kheer will thicken upon cooling and will thicken further upon refrigeration. 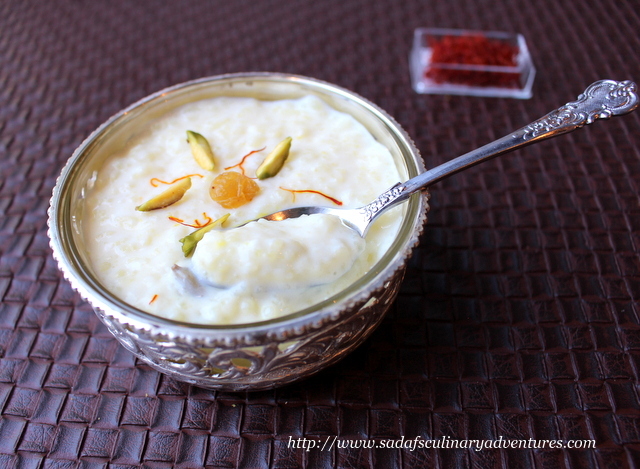 When kheer is slightly cool take it out in a serving bowl and refrigerate for a few hours. Garnish with chopped or slivered nuts of your choice.